Bastille Day guests of the French Ambassador were greeted by Pikemen and United Irish men kitted in apparel du jour, inspired by the happenings of August 22, 1798. They kindly invited Tootlafrance to witness and report upon the 1798 Franco Mayo Celebrations. General Humbert’s military action in Mayo has served to inspire many writers: The episode was mentioned by James Joyce in Ulysses. William Butler Yeats and Lady Gregory set the play Kathleen ni Houlihan against the backdrop of Killala/Kilcummin in French Mayo. Then there was Bliain na bhFrancach-‘The Year of the French,’penned by Thomas Flannigan now this. With the pressure of all that weighty literary heritage on my modest shoulders, I gathered a pen, paper and joined the re-enactment troops/troupes from Dublin airport via Toulouse and westward by coach via many a watering hole to keep their throats wetted for their singing and their tale-regaling. French Emperor Napoleon Bonaparte and I share birthdays – Assumption holiday of the 15th of August. My mother could have called me Napoleon or Assumpta but hey, Deirdre is actually just fine, really. Wee Napoleon dreamt big yet slept small. I once spotted his tiny uniform and bed at the Château de Fontainebleau. Napoleon’s throne however was ever so grandiose for such a tidy-sized man. Napoleonic wars raged from 1792 until Napoleon’s defeat at Waterloo in 1815. Napoleon desired a French empire across Europe and beyond, encompassing St Lucia, the Cape of Good Hope, Argentina and West Indian territories. Meanwhile, the British feared a French invasion. Crafty Napoleon had his sights on using Ireland to invade England. Three ships, 1,019 men with one French General Jean Joseph Amable Humbert being first to set foot at Kilcummin, ancient anchorage of county Mayo, vowing to free Ireland. Back in modern-day Ireland, we watched the vanguard as it was safely piloted to land by a local musician who, upon their arrival, played a jig to which Le Général doffed his hat and threw a few steps much to the glee of locals Kilcummin and Mayonians. The Humbert Development Group, driven by effervescent historian and my dashing host Stephen Dunford, negotiated to return the pioneers’ initial point of contact- “Humbert’s Stone”- to its place and pier of origin. Oh La La! How that stone’s unveiling last July was mighty as they say in this nook of mystical unspoilt Mayo on the Wild Atlantic Way. The gallantry of the re-enactment French, Irish and Red Coat troops flanking Humbert’s Stone, now successfully reinstated on French Mayo Kilcummin soil, would surely be commended by Humbert himself noted as someone who “elicited the unqualified admiration even of his enemies”. Or was that a comment about Stephen Dunford? I guess that man deserves the presidential candidature for the next President of the Republic of Connaught, a contender indeed to Mayo’s own Enda Kenny? “Humbert’s Stone” unveiling was marked by battle re-enactments; open fire plus open fire cooking of herring hooked that morning. Re-enactment officers true to genuine 1798 attire, weapons, pikes, doctors and the Red Coats turned out with aplomb. They paraded from the camp base to the shore, emerging from the sea, well-rehearsed choreography marching and striding eyes front, chin up all the way to Cronin’s Bar. Enigmatic 18 year old Aude Schifferling, a descendant of General Humbert, made contact a mere eight months prior to this trip to offer her services for the unveiling ceremony. She also brought five kilos of Hautes Vosges bonbons as a sweetener to Mayo men.After all, she said, “dans les Vosges, ‘on se marie entre nous!'”. I personally fell for the Violet, Honey, Bergamot varieties. Oh la la! 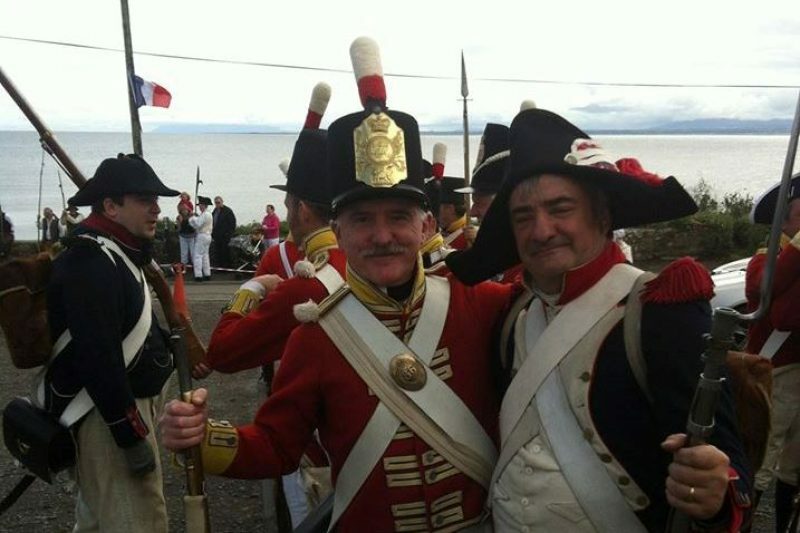 How romance flourished in 1798 French Mayo as Robert Gillard, a soldier of Humbert’s army, fell in love and remained in Mayo. His descendants Liam and Noel Gillard turned up for Humbert’s Stone unveiling day. John Teeling, of The Teeling Whiskey firm, himself a descendant of Humbert’s aide-de-camp Bartholomew Teeling, kindly offered wee bottles of custom Humbert’s Footsteps Whiskey to the thirsty re-enactment crew. The Weather Goddess shined upon the day thanks to special interception by Kevin Vickers, Canadian Ambassadors to Ireland. The Ambassador also renowned for his very physical interception at 1916 events but none of that was required as he is a frequent guest to French Mayo. General Humbert issued the first genuine republican proclamation in Ireland proclaiming the “Republic of Connaught” in Mayo, and installed John Moore into the first presidential office in Ireland as its President. We owe a lot to our 1916 revolution to the gallant Franco-Irish forces. Brigadier General Peter O’Halloran Assistant Chief of Staff of Óglaigh na hÉireann, the Irish Defence Forces too, offered a wreath at the unveiling ceremony and was ceremoniously presented with a miniature recreation bayonet. The original of which was on display that day. Kilcummin Pier witnessed the General’s boat coming ashore, as a matter of fact, they very nearly did not! Our merry men bravely undertook General Humbert’s orders yet having never rowed together, erred in their oaring, circled about whilst adrift in the Atlantic. General Humbert commanded the day and soon they set sail with a little help of a local motor boat. The French Crew never flinched in their loyal Atlantic gaze but much “Oh la-la-ing”, muttering and some hushed laughs escaped. For a month, 100,000 British troops fought the Franco-Irish until they succumbed at the Battle of Ballinamuck. Ballinamuck marked the defeat of the main force of the French incursion during the 1798 Rebellion in Ireland. For a weekend Cédéric age 22 with 3½ re-enactments (the ½ actually gained by his immaculate shoulder pads) joined Parpagua’s Sapeur with Italian experience to those of Laurent, Guillaume, Walter, Michel, Patrick, Eric (15 years a re-enactor and Roman solider and historian with 2 PhDs in history plus several TV show appearances), Gaël (40 years of re-enactments – 87 reconstructions American, Moroccan, France, Indo-Chine) together for some specular battle events. These pals do it for fun – fraternity, freedom with a glimpse of their fragility, showmanship. That in addition to beer and tunes! Songs of olive oil and paprika, eggs but never onions. Let’s just say that ditties are best left to the ear and not ink! Freedom fighters inspired Reel Deel to create a General Humbert Ale. French hops fuse with Irish malt and they propose that you pair the resultant ale with a lightly melted Brie cheese. “Oh La La!”, as they say in Killala – Something that Napoleon’s family must have too when they realised that the bold Humbert had an affair with the Little General’s sister. Oh la la Stephen Dunford! What have you started?